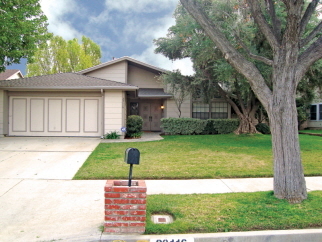 "Beat the Crowds" to this spacious, well maintained, West Hills Home. Award Winning Schools. Close to West Hills Post Office, Chaminade School, West Hills Hospital and Medical Center. Walk to neighborhood Park. Interior Features Spacious, Comfortable and Clean! Large Family Room, Living Room, Formal Dining Room. 2 Fireplaces. Kitchen features an Island with Breakfast Bar and lots of Storage. Atrium. Cathedral Ceilings, Newer Carpet and Fresh Paint. Double Door Front Entry with Stained Glass Window. Large Double Door Entry into Master Suite with large Dressing Area, Mirrored Wardrobes and Double Sinks. Private Soaking Tub/Shower. Large secondary bedrooms. Laundry Room. Washer/Dryer Included without Warranty. Pool Size Private Backyard. Exterior Features No Steps from Sidewalk to Entry. Good Curb Appeal. Cul de Sac Street.